Mason Lake is a community and a lake south of Belfair on the isthmus of the Kitsap Peninsula, centrally located between Grapeview and Harstine Island to the east, and Twanoh State Park to the west. The second largest freshwater lake in the county, over 1,000 residents live year-round on its shores, though it was originally a community for summer vacation homes. Today, as they have for decades, Mason Lake waterfront real estate owners enjoy gliding across the lake in their power boats, on jet skis and water skis. It’s ideal for boating, towing the kids on inflatable items in the summer, and it’s long enough that’s it’s fabulous for kayaking and canoeing too – paddling the entire length makes for an excellent workout. Open year-round, Mason Lake is popular with local angles who enjoy fishing for bass, bullheads, kokanee and perch. 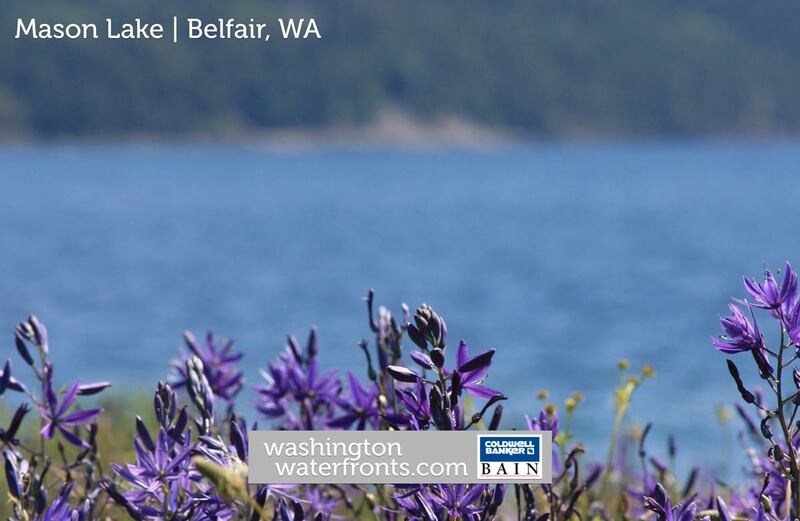 While owning Mason Lake waterfront property means being surrounded by nature, city amenities aren’t far away, with a number of services in nearby Belfair, one of the county’s largest designated urban growth areas. It hosts a farmer’s market on Saturdays between May and September as well as two major shopping centers, an art gallery, a wide range of restaurants and the Mosquito Fleet Winery. With a Mason Lake waterfront home, you’ll have a front row seat for two spectacular fireworks displays during Fourth of July celebrations, with a formal one held July 3 rd , when a barge is floated out into the middle of the lake and a colorful show is enjoyed by all, while the official holiday brings hundreds of small personal fireworks shows. Mason Lake waterfront real estate includes some impressive homes, including lavish cabin-style retreats that feature a private dock and boathouse to go along with those amazing lake views, and gently sloped, no-bank waterfront lots where you can build your own dream home. Take advantage of our industry-leading tools to make your property search as easy as possible and be sure to register for a FREE account so that you can receive email alerts whenever new Mason Lake waterfront real estate for sale hits the market. If you're seeking to sell your Mason Lake waterfront property, contact our Waterfront Specialists directly for a comprehensive listing analysis and to learn more about the cutting-edge marketing strategies we'll use to sell your home quickly for top dollar!